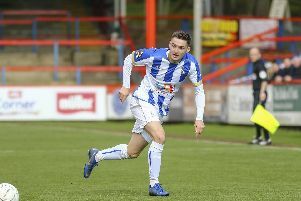 Scott Harrison has admitted that there was more fight in the Hartlepool United squad of two years ago. But the centre-half believes the current players will conjure together enough willingness to survive relegation this season, writes Chris Bell. Harrison was a key player in Ronnie Moore’s Great Escape, but the defender once again finds himself in a similar situation, with Pools just one point and a place above second-bottom Newport County going into Saturday’s match against Barnet. Following the weekend’s game, Pools travel to fellow relegation-threatened Cheltenham Town before welcoming promoted Doncaster Rovers on the final day. Harrison believes the team have enough quality to cement their Football League status, but just hopes that mentally they increase their standards. “It just feels like it [the fight] comes and goes a bit now and it needs to be 100% all the time. “It feels that the lads are letting the pressure get to them, but we need to stand up and be counted for three more games. “We need to stick together. We’ve been playing well prior to the last three games. We need to get back to that. “We are good enough. We went to Portsmouth and drew and drew with Plymouth at home who have already been promoted. Besides personal pride, Harrison wants to get back to winning ways against Barnet to reward the home support. “It’s three games to put everything into it, to get three wins,” he added. “It might not even need that but I think we need to have a bit of pride about it and get the three wins to give the fans something to cheer about. “There was 350 fans at Orient and we absolutely let them down. “The fans have been fantastic. “We got booed off at half-time and full-time and it was fully deserved.